Twitter question from @itsmearjorie: "Ms. Bianca, what is the best way to prevent blackheads and whiteheads?" Almost everyone, even those with great-looking skin, suffers from occasional blackheads and whiteheads. First let's differentiate the two: a whitehead is formed when the pores get clogged, trapping sebum and oil, which then forms a bump in the skin or comedone. A blackhead, on the other hand, forms when the pore opening is exposed. This results in the oxidation of our skin's melanin or skin pigment, producing a dark color. (Think of how bananas or apples turn brown once exposed to air.) Since whiteheads aren't exposed, they don't oxidize (hence they remain white). The best way to prevent these two common problems is to have a regular skincare regimen using the right products for your skin type. Since oil secretion is the issue here, make sure the products you apply on your oily T-zone (forehead and nose) are oil-free and non-comedogenic (a.k.a. non-pore-clogging). Exfoliation is also important in preventing the accumulation of dead skin, which can lead to even worse blackhead and whitehead problems. However, you can only exfoliate up to twice a week at most. Excess scrubbing can lead to irritation, which actually makes the skin secrete more oil as a way of healing itself. If you can't hit the spa for a facial, try a home treatment that involves heat to open the pores easily and ultimately remove blackheads with regular use. Look for a product with orange oil and charcoal powder, which are effective in gently scrubbing away embedded facial oil and blackheads. 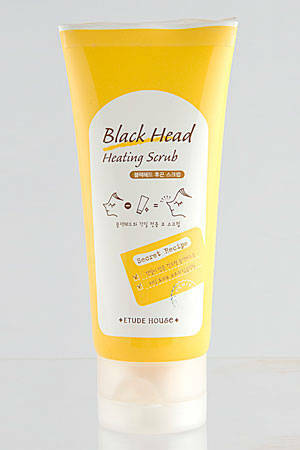 Try Etude House Black Head Heating Scrub (P298), which you can massage onto the affected area for one to three minutes to generate the heat needed to open your pores. Thanks for your question, @itsmearjorie! Cosmo readers, keep 'em coming at @Bianca Valerio or @cosmo_ph! You just might see your question answered here next month!